I love vases, and this one is pretty clever. 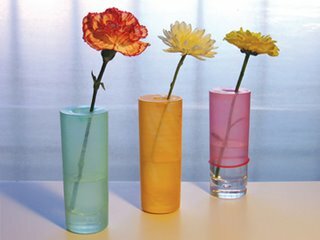 deFlower Vase is a simple way to add beauty and fragrance to any household, while also making it inherently dirty. The coloration of the glass is actually the work of multi-colored condoms wrapped over everyday juice glasses. Finally, a good use for all this summer's mail. Best-case scenario, we both get a couple of these for Christmas. Worst-case, we don't. Where on earth do you FIND this stuff? I love this blog. Josh Spear just posted on his blog the Milk Jug Chandelier! V - another grrrrls weekend project, lol. R - I love the milk jug chandelier too and the no-no knives. can't wait to see what else he comes up with.